After happily volunteering to teach yoga at my daughter’s New York City pre-school, I realized I had some basic logistical problems. How would I teach yoga to 20 children in a space that only holds 10 adult yoga mats? As a yoga teacher, I always had extra mats around the apartment but not one small enough for my daughter, so one night my husband and I cut an adult mat into four small mats. They were just the right size to give to the kids in my daughter's class. The boys and girls loved them. The teachers loved them. We were on to something. The children loved having a mat their size. The teachers discovered that the mats helped the kids know where to do their yoga poses. No more running around. Everyone got focused. And the idea of developing The Little Yoga Mat was born. To all the budding yoginis out there, I invite you to begin your yoga journey with The Little Yoga Mat. Jensen founded The Little Yoga Mat, after creating mats for her daughter's pre-school. She has completed yoga teacher trainings at White Lotus Foundation in Santa Barbara, Virayoga in New York City and is a registered teacher with the National Yoga Alliance. Jensen has a diverse background that includes acting and dancing professionally, fact checking for magazines and producing cooking, history and theatrical documentaries for television. 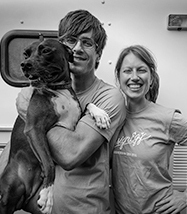 For the past 15 years, she has taught yoga to adults and children in New York City where she lives in a 5-flight walk up with her husband and daughter. Nicaela designed the SUN and LOTUS mats. She is an artist, designer, yogini, writer and mother. A love of creativity, and exploration took her to her first yoga class in 1993 and she has enjoyed practicing and teaching since then, combining her evolution in art and spirit in her life practice. She has designed objects, furniture, packaging for museums and has a love of undertaking new and challenging projects. She met Jensen in 1998 at a teacher training and they have come together to create and bring to you TLYM to enable children to start early in their instruction and path of yoga. Please take a look at Nicaela’s artwork at www.nicaela.com and enjoy! Namaste! 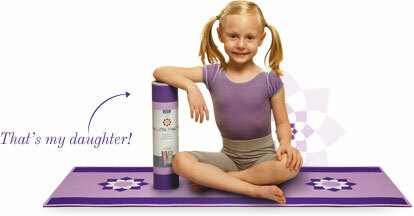 The Little Yoga Mat is a proud member of ASTRA (The American Specialty Toy Retailing Association).